Myofascial pain syndrome is a common musculoskeletal disorder that involves trigger points. 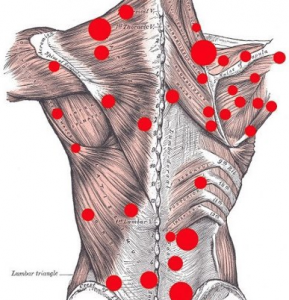 These trigger points are tender regions along the body that elicit pain when palpated (pressed). 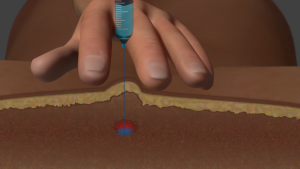 Trigger point injections are used to “deactivate” the trigger points. According to clinical studies, trigger points affect patients with chronic pain around 30-60% of the time. Myofascial pain syndrome sometimes involves a cause of trigger point activation, but with some cases, the cause is never found. Trigger points are located along the base of the neck, the shoulders, along the spine, the hips, the abdomen, and sometimes, along the muscles of the extremities. Localization of a trigger point is often based on the doctor’s examination. The doctor may use ultrasound technology to assess soft tissues, including blood vessels, nerves, muscle, and fascia. Physicians feel the area and assess the patient’s expressions. The most common physical finding is a hypersensitive bundle of muscle fiber, which is hard and nodular in consistency. Trigger points are classified as either active or latent. With active trigger points, there is tenderness at rest, as well as a local twitch response, referred pain, and a palpable band of tissue. A latent trigger point is not associated with spontaneous pain. Trigger points can result from tissue ischemia from prolonged muscle contraction. This is due to accumulation of chemicals, such as serotonin, kinins, histamine, and prostaglandins. Studies also show that trigger points are dependent on an integrative mechanism in the spinal cord. The mechanism of action with trigger point injections is the disruption of the tautness through the mechanical effect of the needle, as well as the chemical effect of the agent injected. The doctor will locate and mark all the trigger point sites using a skin pen. This can be done by palpation only, or with the assistance of ultrasound. When the occipital ridge is injected (back of the neck), there is a release of the entrapment of semispinalis muscle. Local anesthetics with or without a steroidal agent can stop occipital trigger point pain. This technique often involves the use of an ultrasound probe to find the trigger point at the level of the second cervical vertebra. Regarding trigger points over the abdominal wall, trapped cutaneous nerves must be released. These trigger points are often found between two muscles using the ultrasound probe. In a 2013 systematic review of 12 randomized trials that assessed dry needling for upper myofascial pain, researchers found that trigger point injections were more effective than placebo treatment. In addition, dry needling decreased pain, with pain relief lasting for more than 4 weeks. In studies comparing dry needling to lidocaine trigger point injections, researchers found that the lidocaine injections were more effective at reducing pain. Other medications used include corticosteroids, such as dexamethasone and methylprednisolone. Does Botox work for trigger points? Botulinum toxin inhibits acetylcholine (ACh) release and blocks nociceptive neurotransmitters. The development of trigger points is possibly related to excess release of ACh. In a recent study where Botox was used for trigger points of the neck and back, researchers found that the treatment was effective. Climent JM, Kuan TS, Fenollosa P, & del-Rosario FM (2013). Botulinum Toxin for the Treatment of Myofascial Pain Syndromes Involving the Neck and Back: A Review from a Clinical Perspective. Evidence-Based Compl & Altern Med. Kietrys DM, Palombaro KM, Azzaretto E, Hubler R, Schaller B, Schlussel JM, et al. Effectiveness of dry needling for upper-quarter myofascial pain: a systematic review and meta-analysis. J Orthop Sports Phys Ther. 2013 Sep. 43(9):620-34. Travell J, Simons D, Simons L. Myofascial Pain and Dysfunction. 2nd ed. Philadelphia: Lippincott Williams & Williams; 1999. Wong CSM & Wong SHS (2012). A New Look at Trigger Point Injections. Anesthesio Res Pract.